These people breathe only rest and sensual pleasures. Venus is the goddess they worship. The mildness of the climate, the beauty of the scenery, the fertility of the soil everywhere watered by rivers and cascades, everything inspires sensual pleasure. And so I have named it New Cythera (the island of Aphrodite). At the end of the nineteenth century, a small number of European and American artists and writers traveled to and represented the space, and the social place, of Tahiti. In its geographic features, Tahiti resembles many other volcanic islands in the South Seas. Covering a mere four hundred square miles, the isle nevertheless offers a sense of vastness and open horizons to visitors who look from shore toward open sea. Yet it is also characterized by a varied terrain of deep ravines, high waterfalls, long valleys that descend from sharp volcanic peaks, shallow lagoons animated with sea life, and dense tropical foliage-all under a tropical sky that spills a gentle hue along the beach at sunrise, then turns the landscape lavender and deep green in luminous twilight (Fig. 1). For more than two centuries, Westerners-from explorers to travel agents to cinema directors-have acclaimed it as one of the most beautiful locations on earth. By contrast, its cultural meaning, as a social place invested with a particular human history, has been developed by those who have inhabited and used this space for more than a millennium. Artists, thinkers, and philosophers from diverse cultures have commonly identified it as an earthly paradise, a utopian physical environment that nurtures both body and soul. The first European encounters with Tahiti date to the late eighteenth-century explorations by English and French navigators. Their accounts established the paradisaical terms often echoed by subsequent generations of Western travelers. Although most of them were trained as sailors or naturalists rather than as writers or philosophers, they set the stage for European thought about this inaccessible place as an island utopia and prelapsarian garden. Subsequent generations of travelers encountered the inevitable gap between their expectations of a welcoming earthly paradise and the realities of their day-to-day lives in this beautiful but remote and demanding environment. 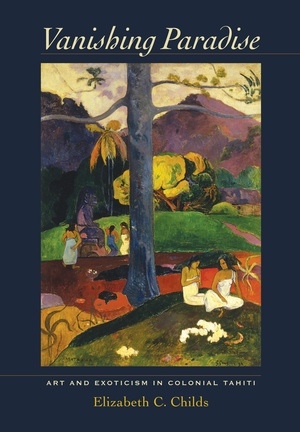 This study focuses on European and American artists' representations of Tahiti from 1880, when the island first became an official French colony, until 1901-years when Tahiti seemed newly inviting and accessible to foreign travelers because they could enjoy there the amenities and security of a modern colonial territory. The first guidebook for tourists, Guide de Tahiti, appeared in Paris in 1889, the year of the great Exposition Universelle, where the colony's products and a vast display of photographs promoted immigration to Tahiti. I have chosen as an end date the year 1901 because it represents a watershed of interest, when the dreams of a mythic Tahiti that had driven visitors halfway around the world began to exhaust themselves. In that year, Paul Gauguin gave up on his Tahitian dream and left Tahiti for what he hoped would be a more "authentic" island paradise, in the distant Marquesas Islands. This was also the year that Henry Adams published in Paris his revised history of a royal lineage of precolonial times, composed largely from the interviews he had conducted with Teva clan members in Tahiti in 1891. The year 1901 also marks the date that John La Farge finally published his memoir of his sojourn in the South Seas in Scribner's Magazine, thereby turning the experience into a set of public memories that helped to promote the work he produced there, which he was exhibiting broadly on the U.S. East Coast. Thus 1901 is a moment when all three of these creative visitors completed significant elements of the exoticist project that had first brought them to the shores of Tahiti in 1891. The first two decades of Tahiti's colonial history followed a century of complex Tahitian encounters with Europeans and Americans. From a contemporary perspective, the dynamic and resilient culture of Tahiti has not only prospered but also refused to be as co-opted by the global tourism that has overtaken such sister islands as Hawaii. But cross-cultural encounters in Tahiti in the 1890s can be understood best vis-à-vis the earlier history of Europeans in Polynesia. Pacific island history itself is complex, the result of generations of movement and exchange between island societies. Human populations probably settled Tahiti and its neighboring islands from about 500 to 800 C.E. The earliest European ventures to the Pacific-those of Ferdinand Magellan and Alvaro de Mendana in the sixteenth century-missed the Society Islands altogether. Thus, more than a millennium passed between the human settlement of the island and the Tahitians' first encounter with Europeans. A passionate desire to know the physical world in all its diversity fueled Enlightenment inquiry. Ralph-Rainer Wutherow has called this spirit of curiosity a "hunger for the world." At the peak of eighteenth-century European global exploration, three expeditions and two countries vied to discover and claim Tahiti, which was already fully possessed by indigenous people whom Bougainville had described as "handsome" and "very hospitable, very gracious, and quick to caress." In 1767, Captain Samuel Wallis of HMS Dolphin claimed Tahiti for England, (re)named it for King George III, and stayed there forty days. In April 1768, nine months after Wallis's departure for England, Louis-Antoine de Bougainville arrived with the ships Boudeuse and Étoile on a scientific mission that covertly sought new Oceanic colonies for France. He stayed a mere nine days and set foot on the island only three times. Unaware of Wallis's actions the preceding year, Bougainville claimed the island for France, naming it La Nouvelle Cythère in honor of the island of love where the Greek goddess Aphrodite was born. During that time (or perhaps during Wallis's brief visit-each country attempted to shift the blame to the other), the Europeans bequeathed to the Tahitians their unhappy legacy of venereal disease, which swiftly felled many in the local population. The European incursions from 1767 to 1848 may have reduced the number of Tahitians from an estimated maximum of 35,000 people to a mere 8,082. Bougainville's other legacy was equally influential. His cartographic skills and the new folio of carefully drawn maps he produced enabled others to embark for New Cythera in his wake. Captain James Cook followed Bougainville, arriving in Tahiti in 1769 on HMS Endeavour, pursuing a commission from the Royal Society in London to map the bays of the "newly discovered" island and to chart the transit of Venus across the sun, an effort that would help astronomers calculate Earth's distance from that planet. His crew met with what seemed bountiful hospitality, mixed with some physical resistance. Exhausted and curious sailors reveled in the fresh food and water, relaxation, and, very quickly, the sexual welcome of young women. Local chiefs, as they had during Bougainville's visit, presented young girls to the Europeans, proposing sexual unions, both to capture the powerful mana of the seemingly wealthy and powerful foreigners and, perhaps, to secure for their own clan any future trade advantages with these white strangers, who had now arrived three times in two years. Published reports of these encounters quickly circulated among a European audience hungry to know more of the tantalizing rumors of "New Cythera," the newfound earthly paradise. Thus in two short years, Tahiti had fully entered the European imaginary as a land of popular desire and exotic myth. Cook made three voyages to the Pacific between 1768 and 1779, with three different purposes: the first for astronomical research but also, probably covertly, to pursue the same goals as the next voyage, of 1773-74: to find the mythical Southern Continent and to assess the Pacific Islands along the way as potential English possessions. He undertook the third voyage in 1777 (which ended with his death in February 1779, in an altercation with Hawaiians) to locate the Northwest Passage, which would have facilitated English imperialist ambitions. Cook anchored his ship at Tahiti once on the first trip, on three different occasions on the second voyage, and once again on the final voyage. Cook's artists on these trips (particularly on the second voyage) produced a visual record of the new terrain, flora, fauna, weather, and even sensations of light. These images ranged from topographical and botanical sketches by Alexander Buchan (who died days after arrival in Tahiti) and Sydney Parkinson, on the first voyage (1768-71), to plein-air oil sketches and full-scale oil paintings produced after the second and third expeditions by the academically trained English artists William Hodges (on the second voyage, 1772-75) and John Webber (on the third, 1776-80). These artists established a core vocabulary of Tahitian scenes, launching key visual conventions of the South Seas into the European imaginary and thereby authorizing selected images of Tahitian geography and culture as the legitimate fruits of Enlightenment science and exploration. In the late eighteenth century two white populations, with opposing aspirations and values, arrived. Whalers discovered the rich waters of Tahiti and its islands: whales still use the warm, deep lagoons off Moorea as a nursery for offspring. These entrepreneurs brought disease, alcoholism, and even slave trade to the islands. Missionaries, a very different population, first arrived in 1797, when the English ship Duff delivered eighteen men and their families from the London Missionary Society (LMS). The Christians enforced new values, proscriptions, and taboos. They banned traditional Tahitian art, forbade the sexualized dances of the old societies, silenced the music of the traditional nose flute, and introduced Western clothing, including such modest tropical fashions as the body-hiding gown called the Mother Hubbard. But the impact of missionaries extended beyond social practice and fashion. In Polynesian societies, where multiple rulers held power over contiguous lands, missionaries influenced the development of local politics and the rise of particular chiefs and their clans. Tahiti was divided intoseven tribal coalitions that maintained control of their districts by violent conquest and marriage alliances. There is no evidence that precontact Tahitians ever paid homage to a single ruler with authority over the entire island. Power seems to have been distributed more or less evenly among the districts, localized in river valleys that gave onto the beaches. The ari'i (rulers) were secular and religious leaders, believed to be intermediaries to the gods. In 1803, however, a chief named Pomare II became "king" of Tahiti largely because he understood, as his father, Tu, had before him, the political advantages of cultivating relationships with white visitors like Cook, who came from monarchies in Europe and expected to find a single powerful ruler in charge of the relatively small island realm. The Pomare clan traded for ammunition and guns and even put some of the Bounty's mutineers to work as mercenaries in local wars of succession. But the real advantage came when the LMS missionaries arrived, offering the ambitious Pomare family a chance to forge an ongoing alliance with a resident European community. The English missionaries chose to affiliate with the Pomare clan at Matavai Bay, mistaking them for the sole legitimate rulers of the entire island. Although Pomare II began his reign in 1803 by emphasizing the old 'Oro cult and conducted lavish ceremonies of human sacrifice, he had publicly converted to Christianity by 1812 while living in exile in Moorea. When he returned to Tahiti with European weapons in 1815, he claimed both victory and leadership of the island as the new Christian "King of Tahiti." The help of LMS missionaries legitimated his reign (because he had embraced the "right" God) and helped him authorize his claim, as a righteous convert, to lead a unified "Christian" Tahiti. Mission schools taught the English language and the new Protestant religion, and Pomare inspired and required mass conversions to Christianity. The missionaries wrote a code of laws in 1819, the Pomare Code, specifying punishment for offenses ranging from adultery to political rebellion to murder. From 1820 on, Tahiti was Christian, if one measured by the number of converts and Bibles and the modesty of clothing. Under that rubric, factions of Catholicism, Mormonism, and Protestantism all vied for preeminence during the nineteenth century. But Tahitian kings, from the public baptism of Pomare II in Tahiti in 1819 until the death of the last king, Pomare V, in 1891 (whose burial Gauguin witnessed just after arriving), were ostensibly and publicly Christian, whatever their private beliefs. With the death of a third Pomare king in 1827, Tahiti experienced a transition similar to that in England during the same era: a female heir took the throne for a long reign marked in both cases by international diplomatic initiatives, but only in England by political stability. Tahiti's queen was Pomare III's young sister, Aimate, who became Queen Pomare IV and ruled from 1827 to 1877. During her youth she embraced indigenous practices, including those of the Mamaia movement, a short-lived nativist religion that reintroduced former cults and practices and eschewed much of Christian belief. But Pomare still had to face the encroachment of Europeans. After she ejected a few Catholic priests from Tahiti in 1836, French forces, led by Captain Dupetit-Thouars, forced her to collaborate. The British failed to intercede on behalf of the queen, and Tahiti became a French protectorate on September 30, 1842. The transition was not the smooth one often recounted in French histories, in which the Tahitians desired the change and the French graciously accepted responsibility. One Francocentric history of 1931, authorized by a descendant of Queen Pomare, claimed, "It was thus that certain native chiefs, judging the ... imposition of a European protectorate [to be inevitable], demanded that of France." Rather, as the historian Matt Matsuda has argued, the actual history involved "political dissension, armed resistance, collaboration, fractured politics, and pitched combat," ending with the imposition of a full French protectorate, against the wishes of both the Tahitians and the British. Queen Pomare at first resisted French rule, but in 1847 she officially acknowledged it. The French, however, bowing to British pressures, omitted from the protectorate the islands of Huahine, Raiatea, and Bora Bora, which continued to resist French rule into Gauguin's time. In 1895 Gauguin actually traveled to these Leeward Islands with French military forces to quell unrest. So the imposition of European governance and native resistance to it continued into the period of this study. Queen Pomare's son ruled as Pomare V after her death in 1877. He was the last member of the family to hold the royal office, because he eventually agreed to sign away the kingdom in return for a pension from the French. On June 29, 1880, Tahiti officially became a French colony, one of the établissements français de l'Océanie (Fig. 2). In 1946, Polynésie française, a group of five archipelagos (Society, which includes Tahiti; Tuamotu; Marquesas; Gambier; and Australs) became an overseas territory, a térritoire d'outre-mer, or TOM. In 2004, Polynésie française received further status as a pays d'outre-mer au sein de la République, or POM. Yet Tahiti still maintains strategic ties to France in its foreign policy and in its military, justice, and education systems. The debates about self-determination have continued, especially since 2004, when Oscar Temaru, a politician of Tahitian, Cook Island Maori, and Chinese ancestry, was elected to the first of five terms as president of the territory. The active work today of the pro-independence party Tavini Huiraatira suggests that the debate about separation from France is not over. One promised land my fancy filled. Relatively few Europeans made it to the shores of Tahiti in the later nineteenth century, because the voyage was long and expensive, and colonial propaganda attracted little French business investment during the colony's first decades. And if few came to the island, even fewer at the end of the nineteenth century voyaged back to European capitals to report on their experience firsthand. The exceptions, who figure large in this study, are Paul Gauguin (1848-1903), who in spite of poverty managed to return to Europe (though for only two years), and Henry Adams (1838-1918) and John La Farge (1835-1910), who returned to America thanks to Adams's private wealth. Most other artists had to rely on armchair exoticism, and the European image of Tahiti, as a result, became primarily mythic and discursive in the century after the island's "discovery." Of all the South Sea Islands, it is Tahiti that has most consistently engaged the imagination of Western artists and writers since Europeans first landed on its shores in 1767. Other sites in the Society Islands-most notably Moorea and Bora Bora and, thanks to Melville, the Marquesas Islands-were known to the late nineteenth-century Euro-American world, but only Tahiti seems to have sustained the dreams of the West, whether it was called by its indigenous name Tahiti or O'Tahiti; or referred to metaphorically as Eden; or termed Utopia (the name given it by Philibert Commerson, the botanist who accompanied Bougainville); or named (by Bougainville) New Cythera, after the mythical place of the birth of Venus. (As noted above, in 1767 Wallis named it King George's Island, after the English king, but that was not a name distinctive or exotic enough to last.) Any study that conjures artistic and cultural life on this island at the end of the nineteenth century must take full account of the earlier European encounter that introduced Tahiti to the European imagination as a vision of earthly paradise. Tahiti may no longer be the only Pacific Island to conjure dreams of escape, and the island itself may have changed in an age of globalization and modernization, but in text, in image, and in cinema the place still conjures fantasy. Stripped of its romantic allure, however, Tahiti is just another pile of rock in the ocean. The largest volcanic island in the Windward group of the Society Islands, it covers 1,045 square kilometers and reaches 2,241 meters at its highest point, Mt. Oroheme. These facts and statistics are not extraordinary. A geologist might well pass over Tahiti in preference for its more dramatic and curiously eroded neighbor Moorea (Fig. 3). That island, in fact, far less populated and arguably more distinctive and conventionally beautiful than Tahiti, came to embody the idea of Tahiti even more than Tahiti itself in the late twentieth century, for it is the site of Club Med and serves as a bedroom community for wealthy Tahitians escaping the crowds of Papeete. In the early 1980s Hollywood producers even chose Moorea as the filming location for the Tahitian scenes of Mel Gibson's saga Mutiny on the Bounty (1984). What, then, about the original island Tahiti made it the place of dreams and an exoticist fantasy for figures as diverse as Somerset Maugham, Gauguin, La Farge, the American painter Pop Hart, and Henri Matisse? The answer lies partly in the earlier literature: as the literary critic Robert Nicole proposes, travelers in the later nineteenth century necessarily experienced the island through a history of "sedimentation," an accumulation of literary and artistic discourse established over the preceding century that shaped both their experiences of travel and their perceptions on arrival. Such layers are revealed in the enthusiastic musings of Adams, recorded as he and La Farge made their way by steamship from Samoa to Tahiti in February 1891: "Tahiti! Does that word mean anything to you? To me it has a perfume of its own, made up of utterly inconsequent associations; essence of the South Seas mixed with imaginations of at least 40 years ago: Herman Melville and Captain Cook head and heels with the French opera and Pierre Loti." Adams here conceives of Tahiti as a composite idea rather than a specific place to be experienced in a fixed moment in modern time. He kept in mind a heady mix of referents: Melville's fiction, popular images from the Cook expeditions, opera, and the novel Le mariage de Loti. Had he traveled a few decades later, Adams would surely also have conjured idylls painted by his companion La Farge, or by Gauguin, who had not yet arrived on the island. Charles Darwin noted on his arrival in Tahiti in 1835 that "first impressions at all times very much depend on one's previously acquired ideas," and in his journal, he measured his firsthand perceptions against those he had read in the accounts by the missionary William Ellis, who had made the trip twenty years earlier. My study pursues what happens when expectations, shaped by European texts and images or by the "preterrain" of travels undertaken to get to a place, meet lived experience, and what artistic and literary work results from that encounter. While each fin-de-siècle traveler had an individual encounter with colonial Tahitian culture, all travelers had some investment in the inherited discourse of enchantment about Tahiti. There is no one Tahiti. No single traveler's record of Tahiti is truer than any other, for the culture changed constantly, responding to the world far from Polynesia, as the islanders engaged European influence and colonial action in the postcontact period. During the colonial period that started with the annexation of the island by the French in 1880, several topoi of Tahiti as a place emerged in the writing of travelers of many nationalities and professions, who idealized the "former" Tahiti as traditional, stable, and enduring. References to the era of European contact are always double-edged, looking back, first, to an ideal moment of purity that ended with the arrival of the first Europeans, and second, to the heroic narratives of the "First Discoverers," poised to record their experiences and to open knowledge of the island to the world. As the ethnohistorian Greg Dening has observed, the interactive history of colonial Pacific culture challenges us to write double histories-from the perspectives of both visitors and islanders. Before Europe sent her sailors, navigators, and missionaries, there was an earlier wave of arrivals, perhaps a millennium before-the first Polynesians. Permanent human settlements in the Polynesian islands are now thought to have been established by 600 C.E. We cannot know exactly why the settlers came: anthropologists speculate that the great early seafaring voyages came about as clan groups fled famine or war. Although their first impressions of contact with the island their descendents eventually named Tahiti are lost to Western history, we can be sure these early settlers did not claim the islands or raise national flags on poles in the name of European kings or a Christian God. Clearly, the Tahitians' foundational myths of those first settlers and the oral accounts they handed down of their arrival stories were distinct from those of the Europeans who came in the late eighteenth century. The Polynesians may well have expressed gratitude for the stars that guided them across the seas in their large double-hulled canoes and praise for the plentiful sustenance and shelter they found on Tahiti. In the nineteenth century at least, the word tawhiti in the language of the Maori of New Zealand meant both the place that the Maori come from, and also the concept of the receipt of an excellent gift. The very word Tahiti that names the island suggests that in the roots of a related Polynesian language, it became a metaphor for a condition of abundance and plenitude. Early settlers may have offered praise to their gods for the generous lagoons that provided the fish for their diets. They may have marveled at the good fortune (or divine gift) of these islands, empty of other peoples and thus inviting their own habitation. Perhaps these first Tahitians noted the landscape of broad plains surrounding high volcanic peaks, unlike Bora Bora, one of the islands from which some of the original settlers probably came. And when they spotted sharks in the lagoons, they would have celebrated the arrival of one of their own gods, the man-shark Taaroa. Before the Europeans arrived, visitors kept coming from Polynesia itself, some of them striving to import their home religion. When priests of the cult of 'Oro arrived with a sacred stone from the marae Taputapuatea, located on Raiatea, they would have celebrated the founding of the new marae at Tautira and Paea and Arue as sites on Tahiti where Oro was worshipped. And the local histories of original arrival and settlement would have been passed down in spoken accounts, ballads, dance, and perhaps in the visual systems of inherited tattoo patterns. The culture of precontact Tahiti was neither isolated nor static; it was not, that is, the inherently conservative culture often imagined by Europeans caught up in Western definitions of progress and modernity, as well as in essentializing notions of cultural difference. We know that early Tahitians exchanged produce, ideas, language, and even people (especially women) with many distant Polynesian islands. Prior to European contact, Tahitians traded actively with Mehetia Island, seventy miles east; with the Leeward Islands, ninety miles northwest; and with the more distant northern Tuamotus. Indigenous Tahitian chiefs of the districts of Pare and Arue even maintained an outpost in Tetiaroa Atoll to provide their home districts with fish and coconut oil. Commercial imperialism was established in Tahiti before the Europeans arrived to trade with their glass beads and nails, and it only grew in the 1790s, as Tahitians brought in more pearls, shells, oil, and hogs from outlying islands and exported new trade goods (like iron and red feathers) that they obtained from the English. Tahiti was thus a dynamic trade center in what the Samoan writer and indigenous activist Epeli Hau'ofa termed a "sea of islands." The British, French, and Spanish were perhaps the most exotic visitors Tahitians encountered in the 1760s, but they were certainly not the first foreigners (or the last) to appear uninvited on the island's shores. Eighteenth-century Tahitians left records of their encounters with the Europeans. Only a few of them are written. More are visual and material, such as pencil sketches, preserved in papers from Cook's expeditions now in the British Library, of costumes, of practices, and of marae, probably drawn by the Tahitian guide and navigator Tupaia, who accompanied Joseph Banks on his tour of the island in May and June 1769 (Fig. 4), and a map of the Society Islands prepared by British navigators working with Tupaia. The guide left Tahiti with Cook on the Endeavour in July 1769; and with his death in Batavia in December 1770, his documenting of this island, which he knew so well, came to an end. Captain William Bligh sketched a third object of indigenous manufacture, now lost, in 1792 (before the notorious mutiny on the Bounty). It was a maro'ura, a red and yellow feather girdle, the most important insignia of sovereignty among Tahitian chiefs (Fig. 5). These leaders assumed their full political power in a elaborate ceremony in which they first donned their feathered belts, some of them five yards long and more than a foot wide. Notably, one of the Pomare family girdles (called Te-ra'i-pua-tata) was made with part of the English pennant Captain Samuel Wallis left on Tahiti in 1767, the very pennant with which he purported to claim possession of the island for the British. By appropriating and integrating the British flag into an indigenous belt of power, the Tahitians demonstrated how well they understood the symbolic political power of the English and desired to incorporate the mana of the foreigners into their system of matter and spirit. There may have been many more physical records of these first encounters from the Tahitian point of view, but because of cultural practices and the deleterious effects of the tropical climate few have survived to the present day. By contrast, many images and texts recount the perspective of Europeans on their first contact with Tahiti. After Samuel Wallis's arrival, ships of exploration came in rapid succession from France, Spain, and again England. In the brief period between 1767, when Wallis's Dolphin anchored in Matavai Bay, and 1777, when Cook's HMS Resolution left Bora Bora, European ships stopped in the Society Islands nine different times. Explorers from these expeditions deposited their writings and drawings at their admiralties, gave them to their patrons, and published them in newspapers and brochures as well as in formal reports that were widely translated and reprinted in the decades that followed. The naval and scientific authorities who had commissioned the expeditions snapped up these collections, as did art academies, museums of art and of natural history, and libraries throughout Europe. European archives of the encounters include letters, journals, maps, newspaper articles, oil paintings by academically trained painters, sketches by amateurs, collections of "natural curiosities" (botanical and zoological specimens as well as examples of indigenous material culture), published travel accounts, and the countless reproductions made for them and for the reprinted editions published in the century that followed. These circulated widely outside scientific and artistic circles and had long-term influence, shaping the expectations of Euro-American visitors to Tahiti at the end of the nineteenth century. The rich visual and textual legacy of Cook and (to a lesser extent) Bougainville, albeit somewhat diminished in the European imaginary by the later nineteenth century, still emerged in that era in references to European acts of "discovery," asserting and thus supporting a long history of European dominance. The psychological anthropologist Jeanette Mageo has stressed that in the study of the colonial Pacific, the constructed past has often been entwined with the needs of cultural identity in the present. Europeans and Americans who recalled the First Explorers (as La Farge called them) in idealized or heroic language reaffirmed that the great dramas-and violence-of encounter belonged to the past and that the arrival of Europeans in the Pacific Islands was settled business. In the late nineteenth century, a time when inhabitants of outlying islands such as Raiatea and Bora Bora continued their armed resistance to French colonial rule, the stories of old explorers could be stabilizing references; to invoke any of them reaffirmed the grand outcome that, despite occasional native resistance in modern times, had been determined long ago. Bougainville was a partner in this dance of historical reference. Key ideas that echo his first accounts of Tahiti surface in fin-de-siècle colonial propaganda and in Pierre Loti's exoticist literature, miming the French explorer's by now clichéd references to the earthly paradise of New Cythera. A little monument dedicated to Bougainville appeared in these years in the capital, Papeete, in the eponymous small park on the quay, although his anchorage had been distantly located on the eastern coast of the island (Fig. 6). Furthermore, the Cercle Bougainville, a popular social club in Papeete decorated with instruments of sailing such as nautical almanacs and barometers, offered drink and gambling to sailors and travelers, inscribing the explorer's name onto a French enterprise his voyage had, ultimately, made possible. But the overall significance of these markers in late nineteenth-century colonial culture was marginal, compared with the more visible legacy of the explorations of Bougainville's English counterpart, Captain James Cook. Now for me it is a pleasure half touching, half absurd, to look upon the queer pictures of the little place we lived in at the end of Uponohu Bay, as it is represented in the prints of Cook's voyages, or the later one of the Duff ... Matavai Bay and then to think of my own sketches, and the different eyes with which I must have seen it. In the same way ... my impressions of today become confused and connected with these old printed records of the last century, until I seem to be treading the very turf that the first discoverers walked in, and to be shaded by the very trees. In Tahiti itself, as the tourist trade increased in the later 1890s, Frank Homes (who in 1894 took over the Papeete photography and curio business started by the self-taught French photographer Charles George Spitz) began publishing nostalgic "antique" views, in postcards that reproduced signature images of the first cross-cultural encounters, such as the British attendance at dance performances in Tahiti and Samoa (Fig. 7), or the accounts by Joseph Banks, Cook's naturalist, of Tahitian funeral practices (Fig. 8). To send such a postcard indicated that the traveler had been not only to distant Tahiti but also, by implication, to the sites valorized by past cultural conquest. The sites of Cook's anchorages and his temporary settlements on Tahiti's shores became the focus of tourist attention in the last decades of the nineteenth century, even though the fort and settlements he built had long since disappeared. A certain tamarind tree was designated as the one Cook had planted at Matavai Bay in the days after his arrival (although a missionary probably planted it at a later date). A visit to the celebrated tree was de rigueur in the earliest tourist circuits of the island: William Spry's in 1876; Dora Hort's in 1891; and Anna [Annie] Brassey's in 1883, as recorded in an account of her obligatory walk around Point Venus, where she not only sought out "the" Tamarind tree, but came away with seeds from it to plant and nurture back in England. One can discern here a Polynesian echo of the fad for the group voyages organized by Thomas Cook in Europe that guided tourists to particular sites along an established itinerary. Among the Polynesian islands, only in Hawaii had true organized tourism taken root by the 1890s, with elite hotels and a menu of guided tours. There was no real hotel in Papeete, and travelers like Adams and La Farge elected to carry with them around the island, like wealthy gypsies, the simple furniture they had bought to furnish their first rented bungalows. In 1769 Cook attempted to track the transit of Venus at a site now known as Point Venus, east of Matavai Bay. He left no permanent marker of his encampment. Nonetheless, in another example of an invented history of colonialism that affirms the colonizer's presence and authority, local residents came to associate a small dressed slab of white coral near the site of the modern (1869) lighthouse at Point Venus with Cook's original camp (Fig. 9). They added a brass marker to commemorate the spot. Together, the new lighthouse and the marker asserted Tahiti's entry into the Western world of science, engineering, and safe, modern navigation. In 1901 Sir Charles Markham, of the Royal Geographic Society of London, erected an even more imposing monument: a column, surmounted by a stone sphere, standing on a plinth in which the "Cook Stone" is embedded (Fig. 10). The coral, encased in a modern monument, becomes a relic of exploration, attracting foreign visitors. This turn-of-the-century monument announces early European contact as the beginning of the island's official cultural history, that is, "worth" remembering, at least for the English, who may have erected it as a gesture of nationalist pride in the midst of a colonial French society. It would be years before a Tahitian riposte to this commemoration of eighteenth-century English exploration and science would be constructed: the religious site Marae Arahurahu near Paea now preserves a monument-a major marae-that was a site of both an indigenous ritual and of cosmogonic knowledge of the Tahitian universe. Cook's monument celebrates the birth of a European idea as much as the work of a particular Englishman who landed on the shores of this island. With the arrival of Cook, Bougainville, and Wallis, Western mythicizing of Tahiti began, a process that the cultural geographer Jean-François Staszak has called tahitisme. From these eighteenth-century origins of encounter and representation, this island emerged as New Cythera, as King George's Island, and the Tahiti of the European imagination. The complex legacy of those ideas about place circulated for more than a century, shaping the expectations and the exoticist practices of the artists and writers who traveled to the island in the late nineteenth century. In the late nineteenth century Tahiti embodied Western ideas of an earthly Paradise, a primitive utopia distant geographically and culturally from the Gilded Age or Belle Epoque. Stimulated by fin de siècle longings for the exotic, a few adventurous artists sought out this Eden on the South Seas—but what they found did not always live up to the Eden of their imagination. Bringing three of these figures together in comparative perspective for the first time, Vanishing Paradise offers a fresh take on the modernist primitivism of the French painter Paul Gauguin, the nostalgic exoticism of the American John LaFarge, and the elite tourism of the American writer Henry Adams. Drawing on archives throughout Europe, America, and the South Pacific, Childs explores how these artists, lured by romantic ideas about travel and exploration, wrestled with the elusiveness of paradise and portrayed colonial Tahiti in ways both mythic and modern. Elizabeth C. Childs is Etta and Mark Steinberg Professor of Art History and Chair of the Department of Art History and Archaeology at Washington University.